The Black Friday shopping frenzy that follows Thanksgiving can be exhausting! One of your best protections, and an excellent way to treat your body kindly after a day of indulgence, is to make Black Friday a day for rebalancing the body with energy-boosting foods and drinks. You have heard this before, and it is one of the best pieces of advice we know for maintaining weight. Drinking ample water is essential for many reasons. Following a salty Thanksgiving meal which may have included cocktails, your body could be dehydrated, a condition that leads to fatigue. To address this issue and help your body digest the previous day’s bounty, start your morning with a cup of warm water with lemon. Continue the rehydration process while you shop, by bringing along a portable water bottle. Aim to drink 4 – 8 oz. of water every hour. It’s not hard to do if you remember to sip when you are standing in line, or driving to your next destination. “Never shop hungry” is a rule to live by. If you nosh on healthy snacks throughout your shopping adventures your blood sugar and energy levels will remain steady. That will keep your willpower in check, enabling you to breeze right by the tempting food court – saving calories and valuable shopping time in the process. Portable healthy snacks include sliced apples, a banana, seeds, nuts, or a low-sugar, protein bar. A bit of leftover turkey is also an energizing snack since lean protein keeps blood sugar under control. Forget what you’ve heard about turkey making you sleepy, it is actually the carbohydrates such as mashed potatoes, rolls, and pie that lead to post-Thanksgiving sluggishness. If you find yourself losing steam by mid-morning or early afternoon, green tea could be the healthy, pick-me-up you need. Tea has less caffeine than coffee and contains EGCG, a naturally energizing antioxidant that has proven effective at raising metabolism slightly. Either brew a cup to go, or pop a tea bag into your water bottle for a milder effect. You can also stop off at a restaurant for a quick cup. Just be sure to ask for “unsweetened” in order to avoid excess sugar that could actually contribute to fatigue. A slice of ginger is a zesty addition to your tea, and like lemon, it aids in digestion. Shopping on Black Friday is not for the faint at heart, but with the right planning you can keep your pep while getting some great bargains. Good luck out there! Green Tea Boosts Metabolism, Protects Against Diseases. 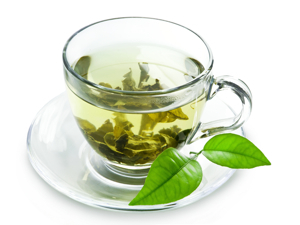 WebMD http://www.webmd.com/diet/news/19991128/green-tea-boosts-metabolism-protects-against-diseases. 11/28/99.